The RTX 2070 Founders Edition will run for $600 or about $100 less than the current price of a new GeForce GTX 1080 Ti. Variants from other OEMs like Asus are expected to come in the same week that will hopefully alleviate stock concerns. 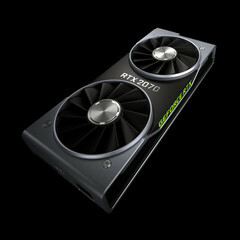 Pre-orders for the RTX 2070 are not yet open as of this writing. After launching the GeForce RTX 2080 Ti and RTX 2080 earlier this month, Nvidia is now gearing up for the launch of the GeForce RTX 2070 coming next month. The green chipmaker confirmed both availability and pricing via Twitter just two days after Asus made public its GeForce RTX 2070 plans. Gamers can get the standard GeForce RTX 2070 for $500 or GeForce RTX 2070 Founders Edition for $600. The latter has a slightly higher Boost clock rate (1710 MHz vs 1620 MHz) with higher power consumption (185 W vs. 175 W) and RTX operations (45 trillion vs. 42 trillion), but both are otherwise identical in connectivity features, memory, and number of CUDA cores. Nvidia already unveiled the GeForce RTX 2070 alongside the RTX 2080 and RTX 2080 Ti last month, but stock for the "entry-level" RTX card has been sold out ever since. Gamers will have to wait three more weeks before they can get their hands on the reference RTX 2070 or Founders Edition model. Unfortunately, Nvidia is offering no pre-order options at the moment and so it could be an all-out brawl come October 17. The only GeForce RTX model still in stock through Nvidia is the GeForce RTX 2080 Founders Edition for $800 USD.